Editor’s Note: This is an abridged edition of our Fast Forward newsletter featuring major trends we spotted this week at CES 2018. For the full version, please contact our VP of Client Services Josh Mallalieu (josh@ipglab.com) to send a request. 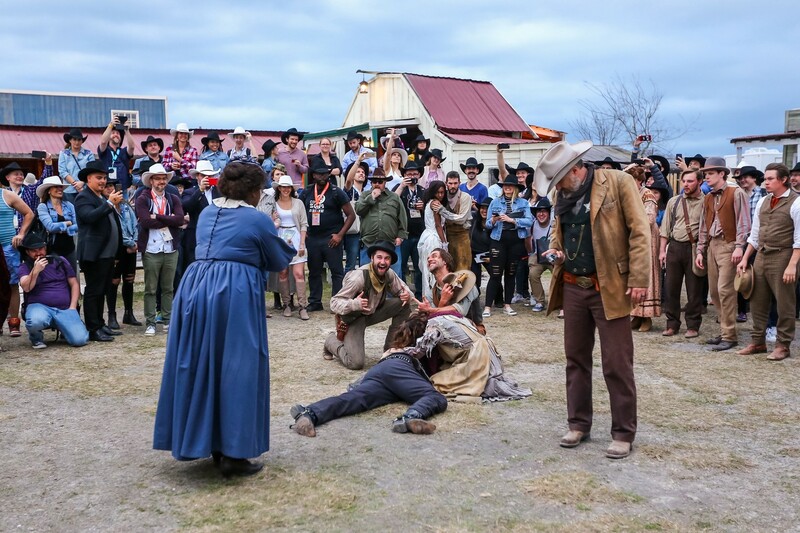 After a frantic five days full of breakfast tacos and brand activations, the 2018 South by Southwest (SXSW) Interactive festival drew to a close on Tuesday. Since last Thursday, the Lab team has been on the ground in Austin reporting back all the cool stuff they are seeing this year and what the innovation-seeking attendees are buzzing about. Here are the four trends that are dominating the scene and leading the conversation at this year’s SXSW. As with last year, artificial intelligence (AI) returns as the №1 topic for the panels, discussions, and festival-goers at SXSW. As a catch-all term that covers everything from machine learning to automation, from computer vision to natural language processing, AI continued to dominate the chatter and inspire new conversations. There were a number of panels that centered around AI’s impact on just about any given industry, be it manufacturing or healthcare. The general consensus leaned towards cautious optimism, although recent headlines have certainly increased anxiety about the application of AI across the board. Tesla and SpaceX CEO Elon Musk, for one, spent quite some time at his surprise keynote address on Sunday to share his worries and concerns about the fate of humanity surviving AI as they become smarter and more entrenched in our daily lives. In fact, he even justified his ambition for colonizing Mars as a necessary backup plan for rebuilding the human civilization on earth in case it gets destroyed by ongoing environmental issues and/or mismanagement of AI. The AI talks remained largely in the realm of planning and thought experiments, with less tangible progress and products unveiled. Compared to last year, however, the talks remained largely in the realm of planning and thought experiments, with less tangible progress and products unveiled. Google set up a big activation in downtown Austin to showcase the various devices integrated with Google Assistant, from smart speakers to Nest thermostat. Largely reiterating its marketing efforts from CES earlier this year, Google clearly wants to make sure people see Assistant as an easily accessible voice assistant on par with Amazon’s Alexa. The latter was largely missing from the festival, but that absence actually speaks more to Alexa’s market-leading position and Amazon’s mainstream marketing strategy for its voice assistant, with three consecutive Super Bowl ads to boot. In other AI-related showcases at SXSW, Panasonic showcased the OniRobot, a tabletop robot that makes the perfect rice balls. Kuri, maker of the eponymous home companion robot, hosted a meet-and-greet at a doughnut shop in downtown Austin. And Sony brought Aibo, the cute robot dog to Austin as well. Overall, the talk of AI is far more exciting than the actual products. At a panel about the future of AI and marketing on Saturday, executives from L’Oreal and Home Depot both commented on how quickly AI-powered enterprise solutions have quickly become table stakes for companies. They also talked about how working with platforms like Pinterest, also featured on the panel, on things like visual search helps them tailor content discovery to reach their customers. Virtual reality might be having a rough year outside the festival circles as consumer adoption slows and mainstream prospect dims, but you wouldn’t know that at this year’s SXSW. Due to its immersive qualities and set-up requirements that kept it from becoming too commonplace, VR experiences continue to be a favorite among brand activations, particularly among entertainment brands. Literally everywhere you go, there is a VR experience for you to try. As much as the quantity remains, however, the quality of those VR experiences didn’t add much to the conversation. Frankly, nothing showcased at this year’s SXSW is interesting or innovative enough on its own to pique the interests of mainstream consumers. With overall U.S. user adoption of VR headsets hanging below 5%, 2018 continues to be a make-or-break year for VR after years of stagnant growth, and things are not looking good so far. Nothing showcased in VR at this year’s SXSW is interesting or innovative enough on its own to pique the interests of mainstream consumers. That being said, VR was still very popular with the SXSW crowd. 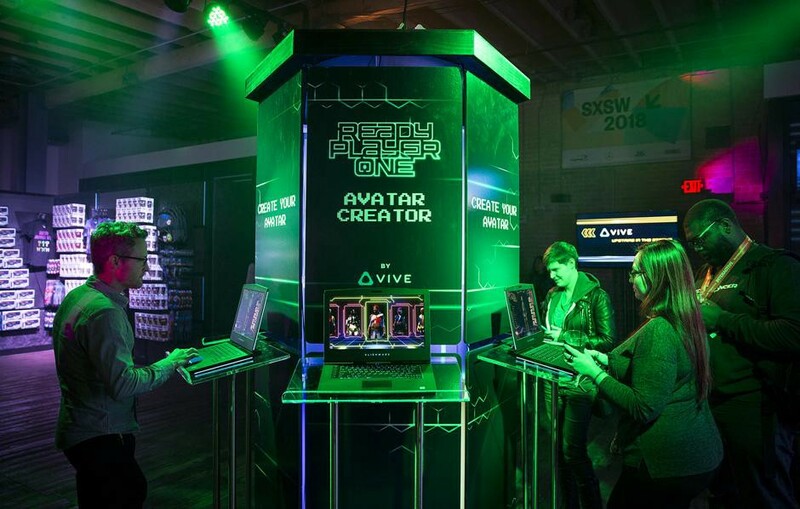 One of the most talked-about brand activations in Austin this year belongs to the VR experiences that Warner Bros. put together to promote Steven Spielberg’s VR fantasy epic Ready Player One, a movie that, according to Rikard Steiber, President of HTC’s Vive North America, “has the potential to define virtual reality in popular culture for a generation.” The studio partnered with HTC and took over an Austin street corner, where several of the sets from the movie are recreated for the demos to give fans a chance to step into OASIS, the VR game at the center of the film. Beyond Ready Player One, there were several other VR experiences that stood out from the run-of-the-mill ones. In the retail innovation lounge, Hershey teamed up with digital convenience retailer goPuff to demonstrate how the confection brand might inspire impulse purchase in a VR environment enabled by the goPuff app. Accenture Interactive also brought a bundle of mini-games that uses VR to showcase products in various environments. Sony also set up a VR soccer game on PlayStation VR at its WOW studio for attendees to flex their legs. Gatorade’s brand activation included a VR training demo for basketball players, as the brand aims to its positioning beyond hydration and into the broader athletic culture. In addition, a bunch of VR content also premiered at SXSW to a receptive audience, which the content creators may soon find hard to duplicate outside the festival. In contrast to the mundane omnipresence of VR, AR seemed to offer a far more exciting alternative. As the shiny new thing this year, a number of brand activations leveraged AR and its variations to spice up the experiences they offered. Although no mobile AR app broke out like we hoped for, attendees no doubt had a blast playing around with the reality-altering technology that does not require a clunky headset. Sony’s AR air hockey table stole the show by showcasing the future of tabletop gaming enhanced by projection mapping. In fact, projection mapping, also sometimes called spatial AR, is a big theme at Sony Wow Studio this year. Multiple group experiences were enabled by the technology, such as the Interactive CUBE that engulfs the players in a multimedia experience, which entertained the crowd and showcased Sony’s idea for the future of digital interfaces. Startup Vuzix also returned to showcase their AR glasses, although we were told that its battery life still woefully remains at about an hour. Outside Sony, augmented reality also appeared in an app developed by Outdoor Voices, which encouraged SXSW-goers and Austin residents to leave the convention center and head to a nearby park to get outside and check out its location-specific virtual shops to unlock special rewards. Similarly, Facebook announced the camera inside its mobile apps will soon enable location markers in the real world that trigger AR experiences in a precise location. This will have a significant impact for local discovery, as it will allow businesses like restaurants and retail stores to surface contextually relevant information to potential customers nearby, and we expect to hear more about it at Facebook’s F8 developer conference in early May. Beyond AR in the traditional, visual sense, a new pair of smart glasses that Bose demonstrated at the festival pointed to an interesting new dimension of augmentation. Instead of supplementing visual overlays, the audio company created a pair of glasses that uses data from motion sensors and your phone’s GPS to determine where you are and what you might be looking at, and triggers contextual audio cues that feed the wearer additional information. Unorthodox as it may sound, audio-based AR devices like this may just usher in the future for context-aware “hearables.” Already, Apple’s AirPods have somewhat normalized the notion of talking to Siri through your wireless earphones, and the AirPods are just a few motion sensors away from being technically able to do what Bose’s AR glasses do. 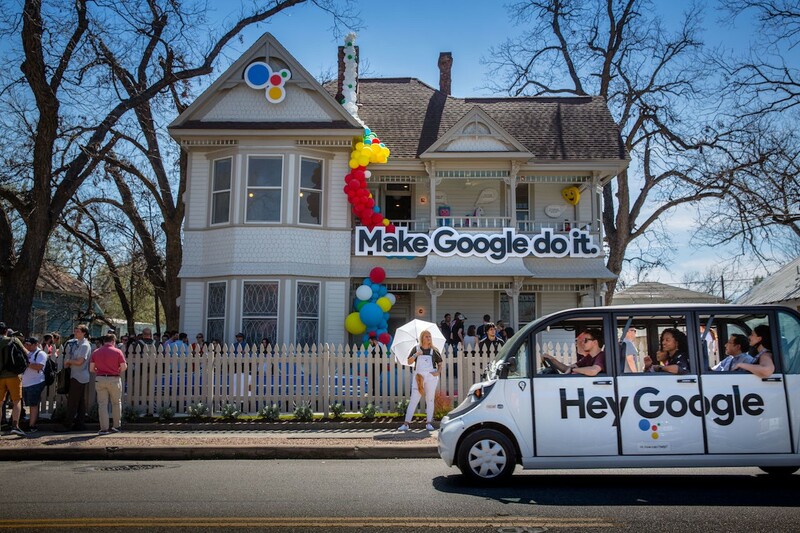 SXSW has become known for its myriad of brand activations over the recent years, and this year is certainly no exception. A number of brands and digital publishers converted bars and restaurants in downtown Austin, particularly along Rainey Street, into “brand houses” to showcase their latest innovations and offer the festival-goers unique experiences. A common trend among nearly all the activations on display was that they are by and large created for generating social buzz, particularly on Instagram. Sure, the experiences themselves are often interesting enough to get attendees to wait in long lines, but it is clear that the end point for many brand activations was meant to be an Instagram post, be it the baby goats-petting yoga classes courtesy of Viceland or the Under Armour house where attendees get to try out smart sneakers on a trampoline and get a photo of the moment. Bravo’s activation for its returning series Imposter is perhaps the most illustrative of the trend, as the cable network invited attendees to fake vacation shots on fancy sets that included a yacht and a private jet. The three collaborative murals commissioned by Dropbox is another Instagram-worthy attraction. Notably, Snapchat seemed to be out of vogue this year at SXSW, with few call-outs or integrations spotted at activations. Interestingly, this brand activation taps into LARPing (Live Action Role Playing), a subculture trend that is merging into mainstream spotlight and starting to be harnessed by brands. Previously, Disney announced it is building a Star Wars-themed hotel in Florida where the guests will get to play roles in the expanded Star Wars universe during their stay, in a hotel that features replica of the iconic sets from the franchise. This is an emerging area more hospitality brands should investigate to find new customers. We also saw some brand activations proudly designed to serve the ladies. For example, dating app Bumble created a space to empower women both in their personal and professional lives, completed with Instagram-friendly interior design. Starz also created a female-focused activation to promote two upcoming shows, Vida and Sweetbitter. The network worked with all-female vendors to create a full five-sensory experience with manicures, custom T-shirts, candies, and vinyl records to get SXSW attendees interested in the two shows. Beyond the usual suspects of Uber and Lyft, both of which returned to Austin last summer after missing last year’s festival due to municipal regulations, we also saw an influx of on-demand car rental services at this year’s SXSW. Car2go, the on-demand car rental service from Daimler, was prominent at SXSW, with plenty of Mercedes cars parked around downtown Austin ready to serve the event-goers. GM also brought its short-term car rental service Maven to Austin to lease their fleet of cars to drivers who don’t own a car on a short-term basis so that they could still freelance as an Uber/Lyft driver during SXSW. In addition, the big car stunt at SXSW this year came courtesy of Smart fortwo, also a subsidiary of Daimler. 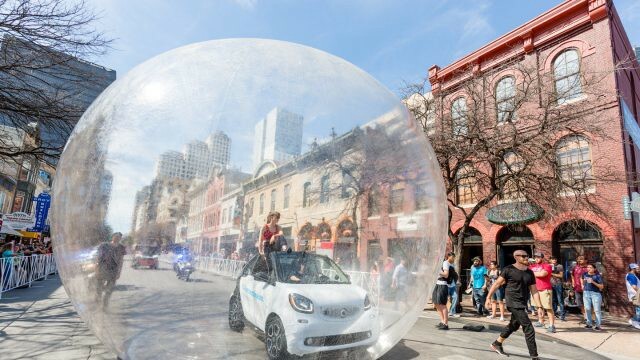 The company put one of their electric cars inside a giant bubble, sealed it, and rolled it down 6th Street in downtown Austin. The activation is meant to demonstrate the model’s eco-friendly zero emission feature. Overall, it is clear that this year’s SXSW has a lot going on. But amidst the chaos of brand activations, panel discussions, and industry networking, there is a sense of directionlessness that was felt by many attendees, especially those in the marketing world. When speaking with AdWeek, Kasha Cacy, CEO of UM U.S., commented that SXSW needs to “have a clearer positioning,” and we couldn’t agree more. Here are some of the startups our partnership team met up with in Austin that provide unique innovation-driven brand solutions. Augmen.TV has developed a new kind of second screen viewing experience. They use computer vision to recognize the content on display and offer a real-time AR experience to accompany the viewing experience. The AR experiences include interactive 3D objects, ecommerce or real time statistics. Today all the AR content is accessible through the Augment.TV mobile app, and they are building an SDK solution that developers can integrate into third party apps. Wrnch.ai is a software platform teaches cameras to read human body language. The software tracks up to 63 body parts and creates 2D/3D skeleton models around a subject. These models can be used in many different ways from powering cashierless Amazon Go-style retail solutions, to full body animation for VR, or even to help train AV to better understand the pedestrian activity around them. Instreamatic is an AI-powered platform for voice activated ads. Users are able to have a call-and-response type of conversation with a brand through their ad unit. The company is focused on mobile today (Amazon and Google have yet to support voice-activated ads on their platforms) and their conversational AI is able to process 50 different languages. Nextdoor is a private social network for neighborhoods. It fosters local community-focused users who are verified based on their real address. Similar to Facebook, the platform has a news feed that emphasizes content such as recommendations, classifieds,events, crime/safety, and more. Brands can target their ads by DMA, zip code, basic demographic data, as well as other first or third party data. Ads will also remain locally relevant with support for dynamic creatives. Spotted is a celebrity recommendation engine for brands. It houses the world’s most robust celebrity data set that helps agency partners make smarter, more authentic celebrity recommendations for their clients. Instead of relying on hype and intuition, Spotted can identify celebrities who are authentic fans of a given brand, and discern whose audiences are most likely to convert into customers for the brand. For brands, the major takeaways from this year’s SXSW came across loud and clear, reiterating a strong focus on AI, AR, and digital-driven brand experiences. When dealing with the hype surrounding AI, brands need to learn to hone their focus on the applicable solutions that leverages in-market AI solutions, such as analytics and creative tools powered by machine learning or computer vision powering customer data collection from images and videos, to supercharge their business both on the customer-facing side and the backend. While we are still at least a few decades away from the kind of superintelligent AI that Elon Musk is warning about, brands have much to gain from utilizing those software tools to optimize and even automate their operation. For example, a service brand can use AI to discern foot traffic pattern and better manage their staffing situation. The wax and wane of VR and AR on display at SXSW points to an intriguing market dynamic where AR, despite being later to market, now seems to have a better shot at mainstream adoption and as a viable mass marketing tool, especially for delivering contextually relevant information in real-world scenarios. After all, the Interactive portion of SXSW is exactly the kind of place that VR can reach an interested niche audience. So despite of VR’s solid outing at SXSW this year, its overall market relevance has largely decreased after years of stagnant growth. If your brand wishes to reach an audience outside the festival and exhibition circuit, it is time to look beyond VR and start exploring AR to build out their immersive content offerings. For example, a retailer can learn a thing or two from the aforementioned Outdoor Voice app and uses AR to drive store visits. As for brand experiences, this year’s SXSW showed that we are now truly living in a digital-driven culture. While it is important for brands to come up with a unique experience that captures your brand essence to draw in attendees, it is equally important to design an experience that encourages social sharing and content creation so that the impact of your brand activation will be amplified tenfold on social networks. You can go as elaborate as HBO, or you can take a more intimate approach like Bumble. The end goal is the same — to drive cultural conversation via digital channels. In an age of information overload and ad avoidance, unique brand experiences can be a great way for brands to cut through the noise and convert customers into brand ambassadors for maximal exposure. If you’d like to have a customized deep-dive into how your brand can tap into these new trends that surfaced at SXSW, please reach out to our VP of Client Services Josh Mallalieu (josh@ipglab.com) to start a conversation.